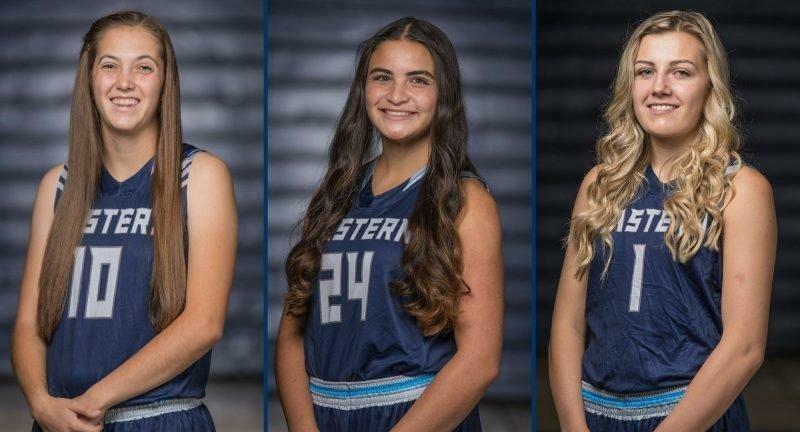 Three Utah State Eastern women’s basketball players have been named to all-conference teams at this year’s Region XVIII Tournament. Sophomore Madison Loftus was named to the All-Region XVIII first team for the second time in her career. Sophomore Kaitlin Toluono and freshman Alyssa Crumley were both named to the All-Region XVIII second team. Loftus led the Eagles in scoring with 14.4 points per game while also averaging 3.8 rebounds and 2.3 assists per game. She ranks second in the Scenic West Athletic Conference in scoring per game and first in the conference with three-point percentage and three pointers made. Toluono nearly averaged a double-double for the Eagles in 2017-2018 by scoring 9.6 points and grabbing 9.3 rebounds per game. She ranks second in the SWAC in rebounding and has grabbed 251 rebounds this season. In her freshman season, Crumley was second on the team in scoring with 12.9 points per game. She was also tied for third in the conference for scoring per game. Crumley also averaged five rebounds per game and shot 50% from the field. The Utah State Eastern women’s basketball team finished the season 17-12 overall and in fourth place in the conference standings. They will play the top seed Salt Lake Community College on Friday evening in the Region XVIII Tournament semifinals. All games conference tournament games will be streamed live on the SnowTV YouTube channel.